Click the interview which you want to see! Yamashiro, Director of Okinawa Onna fishery association. Yamashiro has been living with Onna’s sea as a fisherman. He feels loosing corals for local fishermen are a life-or-death problem. Thus, he is aiming to plant 1,000 corals in a year and 10,000 corals in 10 years. Okinawa’s sea was filled with corals 40-50 years ago. However, land development, red clay outflow, and crown-of-thorns starfish issues arose and they heavily damaged the corals. We created a foundation for coral conservation with Japanese Consumers’ Cooperative Union (COOP) in Okinawa and planted cultured corals back to sea. 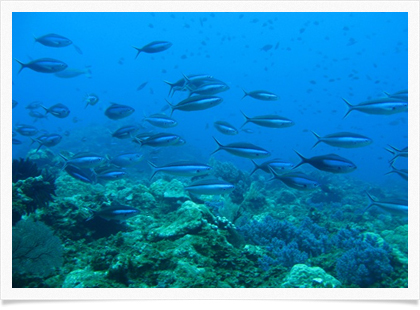 In the last 10 years, we observed that seawater became clearer and the number of fish increased. We will be very happy if the other part of the world utilizes our accumulated technology for increasing corals. 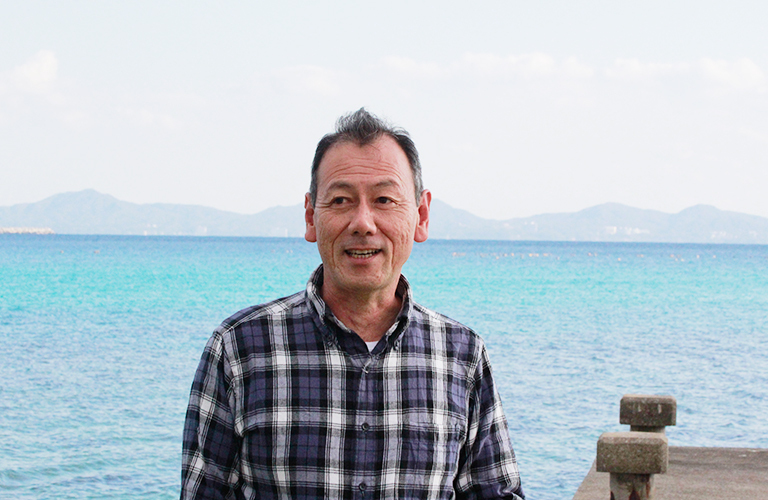 Kazuhiko Sakai is the only professor, who dives and does a research on corals at University of the Ryukyus and mainly works at Sesoko Station.He researches on genetic architectural mutation of corals genotype and latitude gradient pattern in corals community structure including global warming. 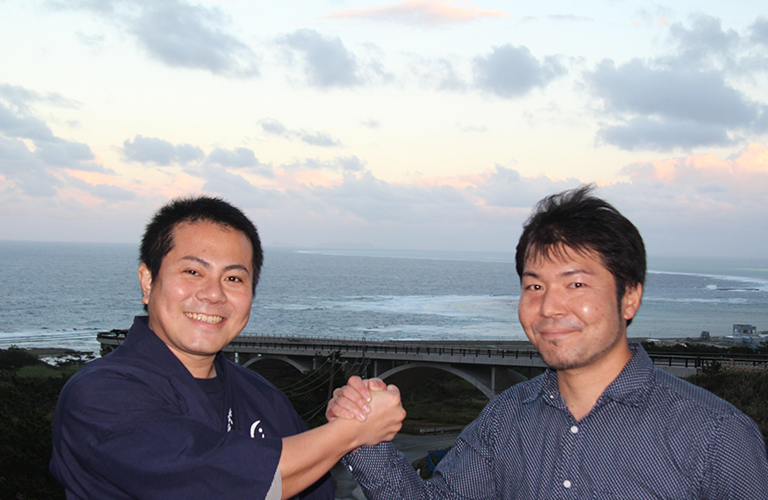 And he is expanding collaboration researches in Japan and overseas. I research on ecology and population genetics. I do scuba diving, see different kinds of corals, and check how many of them and how they are distributed. Also I research on coral’s egg production by using their DNA. World sea temperature increased in 1998 and 80-90% corals in Okinawa were dead. Marine organisms lived around those corals decreased dramatically and coral reefs in Okinawa were changed completely different. Corals are very sensitive to environmental changes in the world. If carbon dioxide in the sea increases, it increases an acidification of marine water and then damage corals. Environment in the world is changing. Let’s start acting what we can do first such as not throwing rubbish to the sea and face the environment issues in our community. Hideo Matayoshi educates scuba divers about underwater environment and corals. At the same time, he actively participates in coral conservation activities. Corals protect the island of Okinawa and the islands nearby. A sea with beautiful corals attracts many tourists. Corals cannot live without people’s protection. For 200 days a year, we clear away crown-of-thorns starfish and shellfish that eat corals. We participate in coral conservation activities and keep clear underwater visibility. Okinawa has a world-class sea. If we observe the rules, the green turtles, without scaring them away, can swim with you! Kouji Kinjyo, Director of Sea Seed. Kouji Kinjyo saw a large scale of corals bleaching in Okinawa in 1998 and decided to culture coral in his company. 2005 Released cultured corals and successfully breed for the first time in the world. When I was a child, I saw a view like heaven however, I saw it was alarmingly disappearing and I started to take actions. action to conserve corals because I felt alarmed to see them disappearing. If human continuously separates from nature, human will never be one with nature. Don't look and don't touch cannot change anything. There are many people who are concerned about protecting the environment but don't know how to get involved. Meeting many people and recognizing the value of nature initiate actions in protecting it. We believe it is important to give information on how to get involve. We planted over 100,000 corals. To protect the nature, our process is not only to observe but also to take actions. It is a work-in-progress and we hope to spread it from Japan to the world. The Sea of Okinawa’s sea is filled with colorful living things. From this point of view, one can say that Okinawa is proud to be one of the best islands in the world. Chihiro Tominaga, Manager of Nature Conservation Division, Department of Environmental and Community Affairs Pursuing natural environmental conservation activities for regional designation. Engaging in coral transplanting manual and crown-of-thorns starfish countermeasure guideline to plan rules that nature and people can face each other well. To conserve coral reefs, the prefectural and national governments promote the expansion of marine protected areas. On March 5, 2014 Kerama islands are designated as a national park and a marine park is going to be expanded. Designation of a marine park is planned in the Okinawa Senseki Quasi-National Park located southern part of Okinawa. In Okinawa, coral reefs are used for eco-tourisms spots. Prefecture government is spreading use of conservation area agreement and educating business owners for scuba diving. Variety of organization are monitoring coral reefs, controlling crown-of-thorns starfish, and dispersing coral reefs education in Okinawa. Prefecture government supports a part of those activities by spreading the information and building platform to share the ongoing activities. March 5, 2014, Coral Reefs Conservation Activity Support Platform (sango pulaho) will be held. Please come and visit us to see 2000km coral coverage on Okinawa coastline information, monitoring photographs, and crown-of-thorns starfish cleaning condition on maps. In Okinawa, community life and local coral reefs have been related deeply for a long time. Each community must conduct coral reef conservation activity independently. 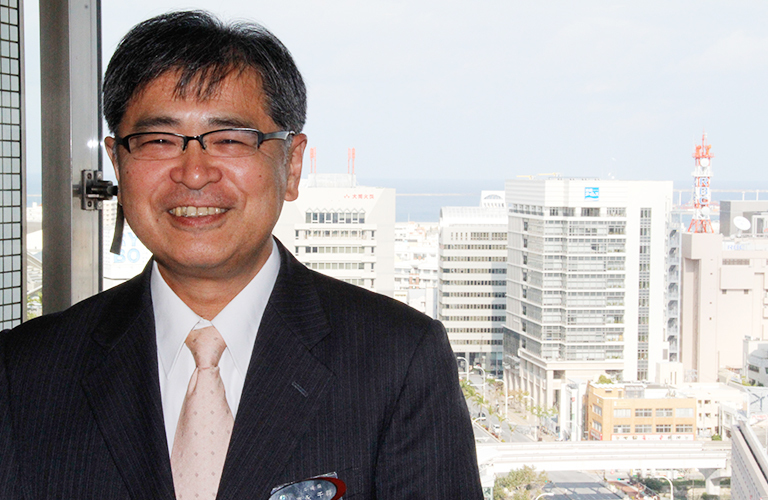 To boost the activity for the entire Okinawa, the prefectural office will build a cooperative framework to support and connect its regions. We are saving Sekiseishouko, the biggest coral reef in Japan and coral reefs around Sekiseishouko from crisis and raising funds to regenerate rich and beautiful coral reefs. Sekiseishouko Coral-reef Fund is set based on Act for the Promotion of Nature Restoration to bring past Sekiseishouko coral-reef back to now. It is important for community to participate in saving coral reefs from coral bleaching, crown-of-thorns starfish, red soil, and water contamination. Small groups can speed up conservation activities that government cannot cover. For instance, when crown-of-thorns starfish mass generated, we heard there is a new expel method, acetic acid injection in Shikoku region. We obtained the injections faster than anywhere and applied to crown-of-thorns starfish. Regarding red soil runoff, building a shallow slope or setting up a settling basin are the mainstream civil engineering works. However, we think farming method need to be changed to prevent red soil not to runoff from farms. Government organization can provide technical support to farmers but it is difficult for them to support financially. We support farmers financially and are looking for a new farming way with farmers to find fundamental solution for red soil runoff issue. Since new Ishigaki Airport opened and Yaeyama islands became more accessible, tourist business such as scuba diving and other marine leisure are heating up. However, in the meantime, water contamination occurred and damage to coral reefs are getting bigger. At Sekiseishouko, there are fishery and tourist industries as well as marine transportation and other community activities. We cannot stop all those activities, but we think we can have life styles which maintain and stimulate our lives and industries and coexist with coral reefs. Save the Ocean of Kume Island is made of 14 different associations that work for Kume-jima coral conservation, cleaning under the sea, and red soil runoff prevention activities. The 14 associations include local businesses, businesses from outside of island, Kume-jima diving safety planning association, Kume-jima fishery association mozuku aquaculture production division. Based on the idea of “enrich the sea, enrich the land”, our organization has done both land and marine activities. We buy from the working scuba divers the coral-eating shells they collect. As part of the marine activities, we also provide financial support to clean the sea. We plant vetiver and install preventing plate to prevent red soil run-off as land activities. Vetiver is planted by segment and does not grow naturally so it is easy to control. It is not strong with pesticide so we can remove it if necessary. Thus, it is a perfect plant for red soil run-off prevention. Pupils from Kume-jima elementary and other schools plant vetivers as a part of environmental program course. Each pupil can experience planning vetiver. Cooperation from farmers plays an important role in the prevention of red soil run-off. To further conserve the environment and increase profit, we invite farming instructors to educate farmers for effective farm management. We feel that through these activities, the attitude of farmers and children are changing gradually. Activities to clean the sea can help develop rich human resources. We want to continue create an environment that makes both locals and tourists happy. 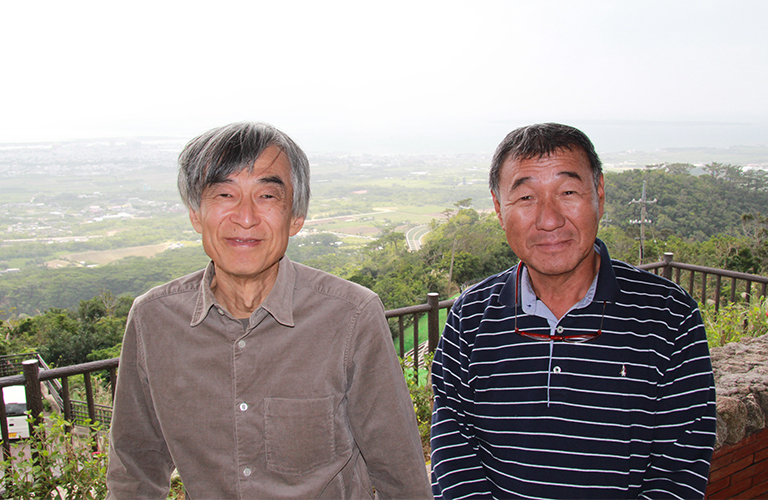 Director of Okinawa Coral Reef Conservation Council Okinawa to form sustainable society, I am working on coral reefs conservation to bequeath healthy coral reefs to the next generation. Education is important in conservation activities for coral ecosystem. I teach coral biology at elementary school. Recently, we are more interested in corals but except fishermen including us, Okinawan don't have many opportunities to see corals. We didn't have opportunities to learn about corals till more relaxed education policy is promoted and general study class is integrated in to teaching guideline. When we take pupils and their parents to field trip and touch corals, they all get very impressed. And the field trip cannot be done without community’s support. Coral conservation activity can move forward when entire community think together for corals. Our activity is a part of opportunities for people to think about corals. Not only researchers and government, I would appreciate it if each of us feels about corals much closer. Copyright c OkinawaConvention & Visitors Bureau, All rights Reserved.